Warm and friendly people, cozy and unique clubhouse, fun and historic golf course, all at affordable rates. The North Oregon Coast is as beautiful as it is rugged, and the experience at Gearhart Golf Links is one cherished by locals and visitors alike. With the mountains to the East and South, and the Pacific Ocean to the West, a day in Gearhart can be one of the best of your life. The quality of the Links have improved significantly over the last few years, but we have been able to keep the cost to play below what it might be at other top resorts. Our golf rates are Seasonal and range from $50 to $85. 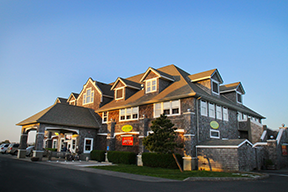 We are proud to offer Resort Pricing with our 3 Partner Lodging sites: The Gearhart Hotel (on property – Click here for the website), Gearhart by the Sea (across the street – Click here for the website) and the Gearhart Ocean Inn (250 steps from the 15th Green – Click here for the website). As the overnight guest wishing to play Golf, you will receive a Resort Card that will get you discounts on your green fees. See the concierge at each property for details! Just four miles north of Seaside along the Northern Oregon Coast, Gearhart Hotel is situated adjacent to our 18th Hole, and just across the dunes from the Pacific Ocean. The 34 guestrooms feature king or queen-sized beds, all with private bathrooms and televisions. 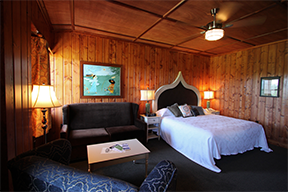 McMenamins’ signature artwork adorns the rooms, integrating Pacific Northwest coastal style. The Sandtrap Pub on the main floor offers breakfast, lunch, and dinner every day. Stop by for a casual meal after a round of golf or before a day at the beach. Have a cocktail or clam chowder on the new deck overlooking the 1st and 10th tees, or duck into the Pot Bunker Bar, a cozy lair adorned with antique golf clubs. Or ask for a meal to go and enjoy it on the beach. Room rates starting at $105/night, discounts on golf available! For more information, please contact Gearhart Hotel at (503) 717-8150. 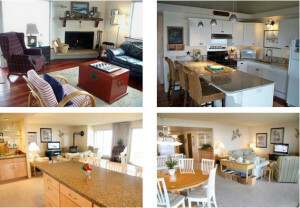 1, 2 or 3 bedroom condo’s to meet your specific needs – Gearhart by the Sea. The lodging office for Gearhart by the Sea is located in the foyer of the Kelly House, and they offer over 200 rooms just across the street. Boasting both Oceanfront and Ocean view rooms, there is a GBTS condominium perfect for you. Room rates starting at $130/night, discounts on golf available! For more information, please contact Gearhart by the Sea at (800) 547-0115. Enjoy Adirondack chairs, croquet & badminton, picnic tables, gas BBQ, fire pit and room for your kids or dogs to play. 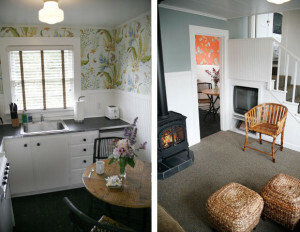 Gearhart Oceans Inn is a timeless boutique property that offers a blend of old-fashioned touches and modern conveniences. This recently restored local landmark has twelve New England-style attached cottages, on a half acre, and is located in the heart of Gearhart. The wonderful Pacific Way Bakery and Cafe and a variety of boutique shops, galleries, and the Natural Nook Nursery are just around the corner. Public tennis courts and the spectacular Pacific Ocean are only a few blocks away. Perfect for family reunions, picnics, croquet tournaments or romantic couples retreat. 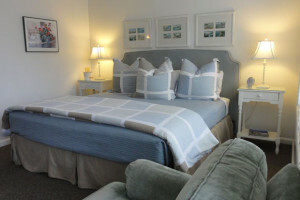 Our lodging selection includes one and two bedroom suites and King & Queen studios. All of our rooms have gas fireplaces or period gas Franklin stoves. Each unit also has an efficiency or full kitchen. Complimentary WiFi, DVD’s and Beach Cruisers. Room rates starting at $125/night, with discounted Golf Rates. Our “Quiet Season Mid-Week” rates are a favorite among golfers. For more information, please contact Gearhart Ocean Inn at (800) 352-8034. There are many reasons for you to consider a membership at Gearhart Golf Links. 18 of the best, purest reasons are these magnificent links-style golf holes we offer the discriminating golfer – golfers who appreciate the ancient and glorious roots of the game, steeped in Scottish lore and ruled by the wind, sea salt and rugged terrain. Gearhart Golf Links offers you UNLIMITED, links style golf year-round as many days as Mother Nature allows. We are confident you’ll love the golf, the people and the surroundings afforded to every member! Give us a call or click here to view our Membership Options and get the enrollment process started! We have a membership program to fit any need. With “fun” being part of our creed, our events and tournaments are just that at Gearhart Golf Links… lots of fun! Our employees at Gearhart Golf Links are here to ensure you have a great time, every time. We maintain a full calendar of fun events, on and off the golf course. Signature events include “The Fall Classic” Better Ball Tournament, “The True Oregonian” Challenging Weather Day, “Winter Better Ball Series – Gross and Net”, “Lucky Looperchauns” Caddies Only Tournament, “Livingstone’s Clam Dig” Golf and Clam Digging Event, Junior and Couples events, and “McMenamins Scrambles” every other month, with themes like “Herb Tarlek Bad Pants Day” and “Mcmenamins Brew Tour” with beer tastings on the course! We even have a croquet tournament in July. PGA Club Professionals Jason Bangild and Zdravko Barbic have been playing and teaching golf for over 60 years collectively. They are students of the game, in both it’s history and it’s advancement. Nothing makes golf more fun than figuring out how to make your swing move the golf ball just a little straighter or a little further. Jason and “Z” are available for individual or group lessons, focusing on any and all aspects of the game, from putting and chipping, to pitching and bunker play, to the full swing with irons and woods. Gearhart Golf Links is built on 100 acres, with almost every inch taken up by its 18 glorious golf holes. There was space left over to build a wonderful putting green near the pro shop, and a massive putting course called “The Clam Bed” between #1 and #9. We are very fortunate to have a fantastic indoor learning facility complete with golf specific fitness equipment, and a state of the art GC Quad launch monitor and virtual golf system from Foresight Golf! The rate for instruction is $80 for 45 minutes of individual video instruction. Special rates for group lessons may be arranged with each Professional.